The shoulder is a ball and socket joint but in this case the socket is not deep and the ball sits on it like a football on a plate. The ball is held in the socket by a cuff of muscle which surrounds the ball particularly on the front, top and back. This cuff of muscle is known as the rotator cuff (fig 1, arrows). The rotator cuff is anchored to the shoulder blade or scapula. Part of this muscle runs from the shoulder blade to the ball (humerus) through a tunnel, under the acromion (fig 1 and 2). People are born with different shaped tunnels and research suggests that as we get the older the tunnel starts to fur up. With time, the muscle running through the tunnel can start to catch on it, rubbing and causing pain (fig 3). Typically, this pain is a muscle use pain, namely when lifting the arm up and reaching above one’s head or out to the side. Patients also notice pain from this muscle when lying on the shoulder at night. Patients get pain from this muscle if they enjoy sporting activities such as overhead racquet sports or swimming with overarm strokes. They get pain during other strenuous activities such as DIY especially above shoulder level. 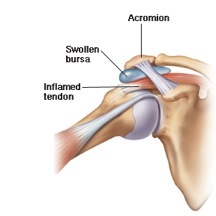 Patients often worry that the cause of the pain is arthritis, but actually arthritis of the shoulder is quite rare. Muscle catching (impingement) pain is very common. If the condition is allowed to continue unchecked then a hole can be rubbed in the tendon. This tear gives rise to pain and weakness and is serious (fig 4). The condition is diagnosed firstly, by the history which the patient gives which suggests this pattern of pain. Secondly, on examination the surgeon endeavours to trap the muscle in the tunnel and to recreate the pain and thirdly through local anaesthetic testing. Here local anaesthetic, such as that used by dentists, is injected into the tunnel to see if the pain can be numbed off. Ultrasound imaging shows the tendons clearly and whether there is a hole. X-rays are helpful but are often normal in this condition and help to rule out arthritis. MRI scanning is a sophisticated harmless, though claustrophobic investigation which is able to show pictures of both the muscle and the tunnel and whether there is inflammation there. There are four treatment methods available for this condition. The first treatment is rest and medications to dampen down the pain and inflammation. 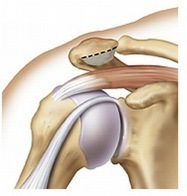 Patients will often have tried this prior to consulting a shoulder surgeon. If this fails to give adequate pain relief, then a course of physiotherapy is often of benefit. Special exercises are taught which help to strengthen the muscle as it runs in the tunnel allowing it to pull itself away from the tunnel roof. This physiotherapy always involves the patient learning a set of exercises with graduated rubber straps to help to strengthen the muscle. The next treatment is a cortisone injection which is administered by the surgeon into the muscle tunnel. Ultrasound guidance is used to confirm it is in the right place. It is a small dose of cortisone which almost never has any side effects on the patient as a whole. These side effects are transitory (increased sugar levels in diabetics, a rash for thirty six hours). A single injection is not known to cause any damage in the local tissues. It is not known how the injection works but many patients notice the abolition of pain after a few days and the ability to get their shoulder going again without pain. Approximately 30% of patients will “be cured” as a result of a single injection. It is my view that this injection works by allowing the muscle to get going without pain and then the momentum gained is sufficient to maintain that level of function without catching. A second injection will be offered to a patient if they have had a temporary or only partial effect from the first injection. A third injection can even be given after three months but it is unusual for patients to need this or gain long-term benefit from it. If patients fail to make an adequate recovery despite these three measures then they will be offered keyhole surgery. The essential problem is that the tunnel roof is too low, so an operation is undertaken to raise or core-out the tunnel roof. The surgeon places a small camera (about the size of a pencil) into the tunnel and a shaver (also the size of a pencil) along the length of the tunnel and cores out the ceiling so as to allow the muscle more clearance to slide without catching. This procedure takes approximately twenty minutes. About half a sugar lump of bone is removed. It cannot come back. It is undertaken under either general anaesthetic or arm block. With the arm block, an injection is given at the root of the neck causing the whole arm to become numb for approximately twelve hours. General Anaesthetic is therefore unnecessary. Patients who are nervous of this procedure, but who still wish to avoid general anaesthetic, can be given intravenous sedation at the time so that they are in a drunken state and not unduly troubled by events around them. They do not actually have a general anaesthetic and do not go to sleep. They usually have no recollection of the operation. The success rate of this surgery depends on the findings. If the Rotator Cuff is just trapped but not damaged or torn, then the success rate is approximately 85%, where success is defined as having an 8/10 shoulder. A 10/10 shoulder is a completely normal shoulder, a 9/10 shoulder is normal but with the odd twinge of pain and an 8/10 shoulder is one in which a patient can undertake the majority of activities but with twinges of pain on strenuous movements such as throwing. If the rotator cuff has already been damaged and is torn, then the success rate falls to 60%. Your surgeon will discuss this with you. Ultrasound or MRI scanning helps to predict the state of the rotator cuff before surgery, so that you will know what the findings are likely to be. Though this is a keyhole operation which only takes twenty minutes, it is nevertheless a proper surgical procedure. Patients may go home the same day or stay overnight. Patients are given a sling which they are invited to try to discard over the ensuing seven days. Patients are permitted to go in the shower the following day and to get their keyhole wounds wet, placing small elastoplasts on each keyhole afterwards. Patients are invited to stretch the shoulder so that it does not become stiff and attempt to have the arm out of the sling for prolonged periods. The majority of patients are able to drive after one week but are then disappointed because the surgery pain lasts at least four weeks. Many will not notice a significant improvement until approximately six weeks after surgery. By three months however most patients have noticed a major improvement and are glad they had the surgery. It often takes that long before they can lie on that side through the night. Everyone notices further and continuing improvement for six to nine months. This surgery has remarkably few complications. A very small percentage (1 in 200) of patients get an infection at the time of surgery but because this is keyhole surgery it is rare and eminently treatable. Another complication is stiffness. Patients can overscar as a result of this surgery and this just delays the recovery. Further cortisone injections may be necessary and extra physiotherapy. This occurs in perhaps 5%-10% of people, one cannot predict which patients are vulnerable to this. The third complication is persistent pain. Despite confirming the diagnosis at the time of surgery and making extra space for the muscle, a proportion of patients may still have pain afterwards. Approximately 10% of patients will have persistent pain at the end of the recovery although many will have an increased range and freedom of movement. Very few people need to live with chronic shoulder pain, particularly of impingement type. It is eminently treatable though a proportion of patients may require key-hole surgery to rid them of the pain.